we thought you could save these photos on your phone and use them as a shopping list on your next visit…and please tell us your favorites too. 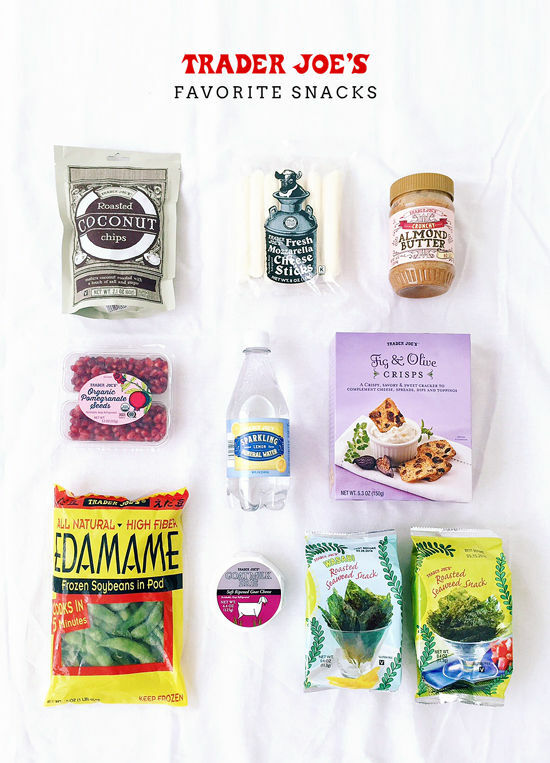 roasted coconut chips, fresh mozzarella cheese sticks, crunchy almond butter (on brown rice cakes), organic pomegranate seeds, we keep lots of sparkling mineral water in the fridge, fig & olive crisps with that goat cheese, edamame is quick and healthy, and we love roasted seaweed snacks (especially the wasabi ones!). i love to get the vegetables that are conveniently cut up and packaged for me. i just notice that i always eat those more when i buy them and they don’t just go bad in my fridge. the brussels sprouts, brocollini, and fingerling potatoes are my favorite. i love trader joe’s frozen brown rice because it’s so easy to make, and joanie introduced me to that cauliflower rice which is my new jam. canned beans and corn are always in my cart. joanie loves the taco mix for the meats she makes, and erika puts it in a slow cooker with chicken stock and chicken for tacos. the asian stir fry makes a healthy meal happen very quickly. the quinoa is a great side dish – cook it in veggie stock and add a bay leaf for more flavor. their coconut oil is very reasonably priced and joanie adds a tablespoon to her smoothies in the morning. you can also cook your chicken in it on the frying pan and throw it on top of a salad for work lunches, their red curry sauce is the bomb (we’ll get to that below), light coconut milk -use this to make ice cubes for your smoothies, pink Himalayan salt makes it okay to salt your food, you can use their flaxseed meal to make , cage free eggs – always eggs (on everything! ), and we love their irish butter you can use the unsalted version to make bulletproof coffee! i love very simple foods for lunch. nothing too saucy or filling. i end up making this bowl with either cauliflower rice (healthier option) or one of the packets of frozen brown rice (just 3 mins in the microwave) and i’m happy every time. a lot of the times i’ll add hot sauce on top. my friends tease me for how often i eat this meal! this is almost a weekly meal at my house. (bri is currently screaming in the background “it’s SOOO GOOOD!! !”) you can easily add any veggies you have laying around, or just make it with chicken. and the best part is, it’s even better as leftovers. i almost don’t want to tell you how easy this is to make because it feels like my little hostess secret. • 1 package organic chicken, i like to use the small cutlets but the breast work well, too. 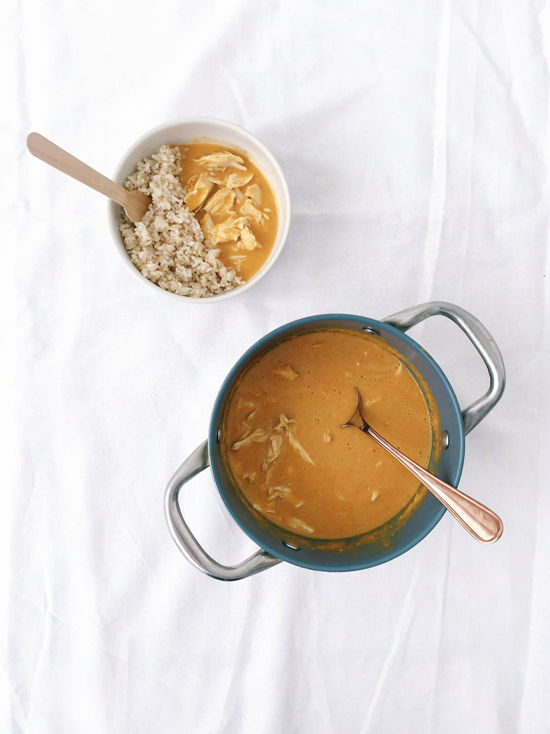 i pour the coconut milk and curry sauce in a pan and add in the raw chicken, i like to cook it over a very low heat for about an hour. if you’re adding veggies throw them in about 20 minutes before it’s done. 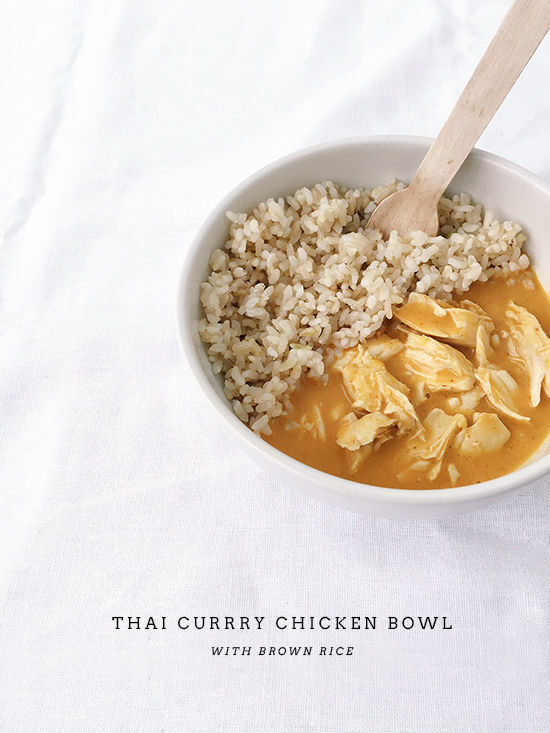 pull out the chicken and shred it with a fork and knife, return to the pan and serve over brown rice. and then there’s the guilty pleasures. bri’s favorite is the vegetarian japanese style fried rice (it’s amazing!) or the frozen mandarin orange chicken. 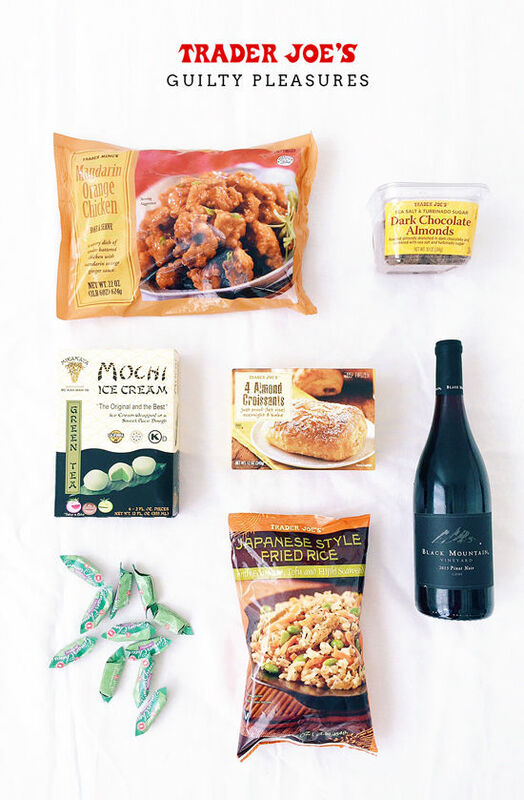 joanie loves the mochi ice cream and her favorite under $10 bottle of red wine is the pinot noir by black mountain (it’s actually $6.99 which is almost too good to be true!). if you are feeling especially splurgy, try the almond croissants, you let them rise over night and bake them in the morning, they are truly amazing. and the sea salt almonds are seriously addicting. for less indulgent evenings, try the ginger chews. 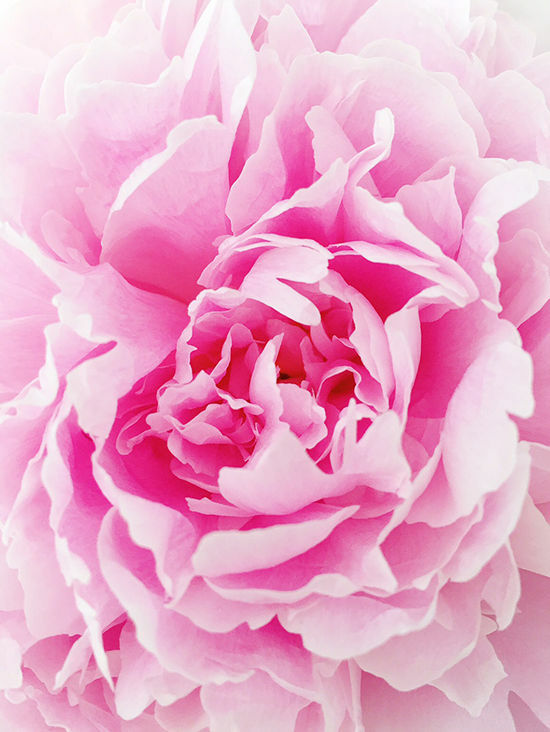 you can’t miss trader joe’s during peony season. an unusually low price of $5 will get you these beauties that are normally wayyy more expensive! 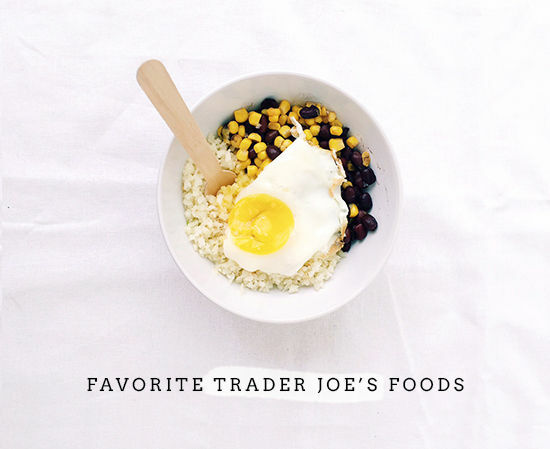 now tell us, what are the items you always buy at trader joe’s? I am obsessed with the roasted vegetable pizza. There’s no cheese which sounds terrible, but it has SO MUCH flavor. It’s amazing!!! I don’t know if they still have them but in DC we would always buy the frozen cheesecake squares. When I was on more of diet regimen, they were just the perfect size to feel like you were getting a desert after dinner but still maintaining portion control. Definitely miss having Trader Joe’s here in Copenhagen! I really wish I could use gifs in the comments, because I had a Beyonce yaaass gif that was perfect. PERFECT! Anyway I love this post. I’m so excited to try new things from Trader Joe’s. I always try to find new things but there are so many people and so many types of everything. I usually end up throwing the California veggie burgers, turkey burgers, and meatless meatballs in my cart and getting the hell out of dodge. My vegetarian boyfriend and I love shoppings at TJ’s!! We’re always stocking up on Cowboy Burgers, Vegetarian Orange Chicken, Vegetarian Tikka Masala, Naan, and General’s sauce! I also love their sesame cashews and dried strawberries! OBSESSED with Trader Joes! What a great post. I made myself their pecan crusted salmon the last two nights, and it’s fantastic. My guilty pleasure is the Chicago mix of cheddar and caramel popcorn. I love how reasonably priced everything is. I also regularly use their coconut body butter and I get compliments on how I smell all the time! My all time favorite go to dip is one tub of the fresh bruschetta, one tub of feta (low fat is great too) and 3 diced avocados! So easy and always gets eaten up! i’m always peeping other people’s carts at TJ’s so this is a voyeuristic fun post for me! i’ll have to check out the riced cauliflower because i’ve never seen that! some of my TJ favorites are the tahini sauce (it’s so much fresher tasting than normal tahini), the broccoli slaw because you can toss it into anything, the jalapeno chicken sausages, sea salt and turbinado sugared dark chocolate almonds, jerky sticks for my pup pup, the flavored vinegars and olive oils (i love the truffle oil and i just bought the lemon EVOO! ), green salsa, and the truffle marcona almonds. basically i love TJs! Girl, let me share with you the best freaking (pref BBQ) corn on the cob recipe using that taco mix: take corn, smother in coconut BUTTER (or oil if you cant find coconut butter but I suggest you find that stuff asap) and throw on a few shakes of the taco mix seasoning and cook. I put A LOT of seasoning on, like go crazy on each corn. I always bring these to a BBQ and they’re GONE. Also, chocolate covered pomegranate seeds are incredible and you can’t go wrong with the macaroons in the freezer section. The spring rolls (tofu or shrimp) are amazing and can be found near the sushi. The cilantro yogurt dip is suuuppper good with any trader joes crackers (but wise crackers are the best). The dried mangos are AMAZING at Trader Joes. We also love those dark chocolate sea salt almonds! love trader joe’s, so i love this!! thanks for all the ideas! One of my favorite items is actually quite boring – they sell bags of pre-made hard boiled eggs. As a “gal on the go” this makes my life so easy. I just grab a couple, add salt and pepper, and munch them in the car on my way to work. My friend introduced me to a salad that she saw them making in the store. Technically, they were putting it on crackers as an appetizer, but I make it and it as a side salad with a piece of chicken. — 1 entire package of the already cooked lentils (as shown in your post) — 1 entire package of their bruschetta mix (I drain a bit of the oil/liquid first) — 1 entire package of fat free feta. Mix it all together and enjoy! Oh god I’m at tjs at least twice a week. It’s an obsession. My guilty pleasure is the Greek yogurt apple cinnamon coffee cakes, probably too many calories but one seems to fill me up until I can have a bit of hummus on my break at work. Oh and all the freeze dried fruit! So many options to satisfy the sweet tooth! The banana nut cluster cereal tastes exactly like banana bread. I don’t even crave lucky charms anymore ha! I will admit to a lack of self control in the freezer aisle. I just run through and grab bags of frozen dinners because I know on nights when I get off work at 8 all I want to do is throw some spinach ricotta ravioli in the pan for 7 minutes and have dinner. Tonight however, I think it’s a chicken curry night! Great post! I also love the 3 minute brown rice. I always stock up on a ton of cheese at TJ’s. One of my favorites are the marinated mozza balls. I also really like the Pasadena chicken salad. The dressing is a little sweet, so I only add half, but it’s filling and has a great crunch! This is so helpful! All of it looks so good and thanks for making it so easy for us to just save the images to our phones. i think i’ve tried all of their ready-made salads! and they are alllll good!! Oh man. They have this frozen pizza that is red bell pepper and mozzarella with this spicy red pepper-infused oil that you add halfway through. It’s the bomb. Their frozen spinach and artichoke dip is also a HUGE party favorite. I buy my sprouted grain bread there, as well. It’s big money saver. Love TJs! dang those all look so good! I love trader joe’s pom seeds! I enjoy reading these types of lists and comments! I love the Arugula, Margherita and 3-Cheese pizzas from Trader Joe’s – probably the most underrated products in the store. Randomly, the vanilla coffee creamer is also a favorite, as well as the reduced-guilt chunky guacamole. LOVE this post! I’m a total nerd and wait by the mailbox for the Fearless Flyer (seriously whoever writes it has a great a sense of humor!) but even better (and I feel totally guilty telling you this during the get fit challenge – best series you’ve done btw!) but the Crispy Cookies filled with Belgian Chocolate (basically Milano’s) are like crack…they are sooooo goood! Cheat day treat for sure! Soy Creamery Cherry Chocolate Chip Ice Cream. My husband is lactose intolerant so the world of ice cream is now barred to him. This is the best soy ice cream product out there. I will even eat it and I serve it all the time to dairy eaters and they have no idea it’s soy. It really is that good. I just wish they’d make it in a bunch more flavors. Trader Joes is always my go to spot when I need to do some last minute grocery shopping. All these choices look delicious and I can’t wait to try it out. What’s your favorite? i love Trader Joe’s! I worked there for a while and it was so much fun! My favorite TJ’s things are: Roasted Garlic Siracha BBQ Sauce, the cereal bars (kiddos live off of them) and the Vegetable Birds Nests. So yummy! I love the pre-cooked roasted brussels sprouts and boiled beets, and lemon pepper chicken that I can all heat up for lunch or dinner. Also love their soups. I always have some of their dark chocolate on hand and love the ginger chews as well. And the dark chocolate toffee espresso beans. Those are amazing! Gotta love their frozen breaded talipia! Really loved this post! Love this post!! I simmer the thai red curry sauce with a can of chickpeas, shallot, and leek. Serve with chopped cilantro and peanuts. Also love the coconut oil for making stovetop kettle corn. I’ll have to try the dark chocolate almonds some time! Please add me to you list. I love Trader Joes ! The cauliflower rice is AWESOME! 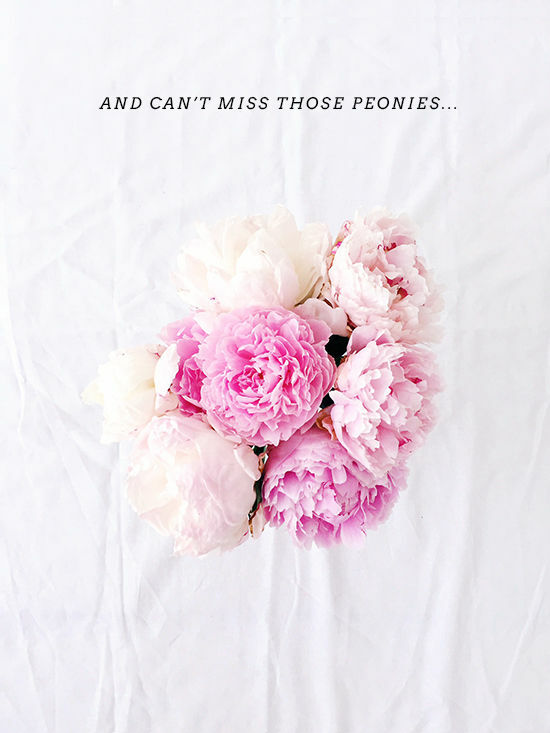 And the peonies are my favorite…I have some on my coffee totable that are almost full bloom. The BEST! this is such a GREAT post!! thank YOU!! As for treats and guilty pleasures, I’m obsessed with both their Dark Chocolate Coated Powerberries and Chocolate Coated Sea Salt Butterscotch Caramels. Enjoy! Thank you for sharing this fabulous post! I don’t to TJ’s often enough and this is a very helpful guide. the espresso bean ice cream is the absolute best!! The frozen baby peas are great in salads, soups, or just heated for a side. I buy several bags every time I go. Scallion pancakes!!! If you haven’t tried them, RUN to your nearest Trader Joe’s right now. They are soooooooo good! Seriously you should try their frozen fire roasted corn!!! It’s the best! I buy it three at a time to have on hand. You will never go back to the canned stuff. I Absolutely LOVE those fig and olive crisps! They are truly my favorite things from Trader Joe’s! I love them with every possible flavor of goat cheese, so good and so addicting! The frozen Macarons are amazing. Sweet great that isn’t over the top. the vegetable masala burgers are so delish! -FLATBREAD PIZZAS- middle eastern flatbread / a spoonful of the original marinara / ova link mozzarella and ricotta //// put on hot pizza stone with the oven at 450 // bake for about 6 minutes // sprinkle on some chopped basil. -GNOCCHI IN EASY TOMATO SAUCE- 1 package of gnocchi / half a yellow onion, chopped / 4 cloves of garlic diced / half a can of cento san marzano tomatoes, chopped //// begin bringing med saucepan with water and salt for gnocchi to a boil // sauté some onions, add garlic after about 3 min, cook until onions are translucent // add tomatoes and a pinch of sugar // simmer for about 5 min // add 2 tablespoons of balsamic and simmer for another 5 min. // when salted water begins to boil add gnocchi and cook according to package instructions. Drain and mix into tomato sauce. // garnish with basil and shaved Parmesan. Sorry, got a little tired of typing recipes on my phone! 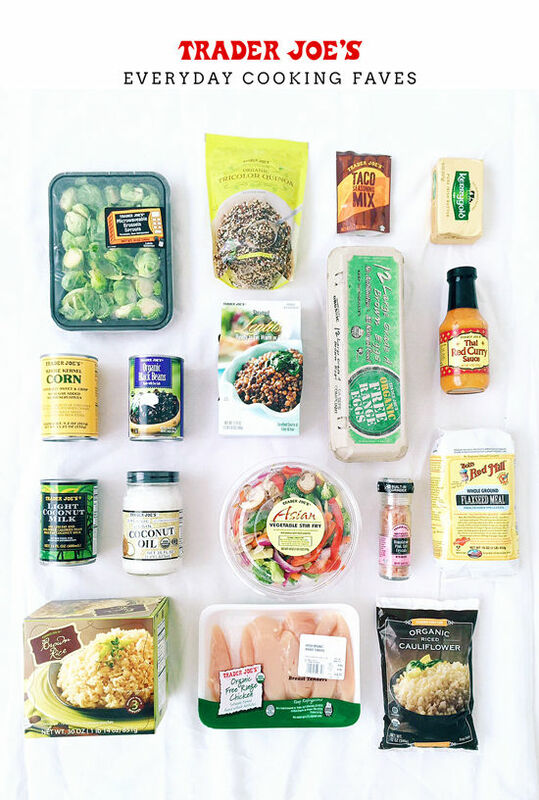 Some additional staple ingredients not listed above are ghee, jar of crushed garlic, the savory sesame crackers, New Zealand cheddar, and shaved Brussel sprouts. I think that’s all. Love this topic. Healthy Snack- FiberFull Granola Bars!! Lower sugar and more fiber and protein than regular bars! Check it out! Chili spiced dried mango. So addicting I can eat the whole bag. Such a great post! I love Trader Joes, I did a post on Trader Joe’s beauty buys up on my blog, they have some great beauty products! The Salted Caramel Gelato will change your life forever, I am drooling just thinking about it!! The Japanese fried rice is the best! It saves me on nights when everything is crazy! I love TJ!! I’ve only found these in CA-their lingonberry scones are Amazing. My bestie just told me about their mini vanilla bean sheet cake, she said it’s the yummiest. I also love the maple leaf cookies. I am so with you on all of these! My favorite breakfast is theirOrganic, fairly sourced chia seeds + Gluten Free rolled oats cooked with their plain almond milk (no other almond milk compares) and topped with their Organic Blueberries, Cinnamon, and Organic Clover Honey. Nom, nom, nom! Um this is the best post ever (and the comments are so informative also!). I’m keeping this post bookmarked, definitely. I adore the tart d’alsace that has ham and gruyere… tastes like a million bucks. The mushroom and brie and tomato tarts are also fabulous. Definitely try them if you haven’t yet. 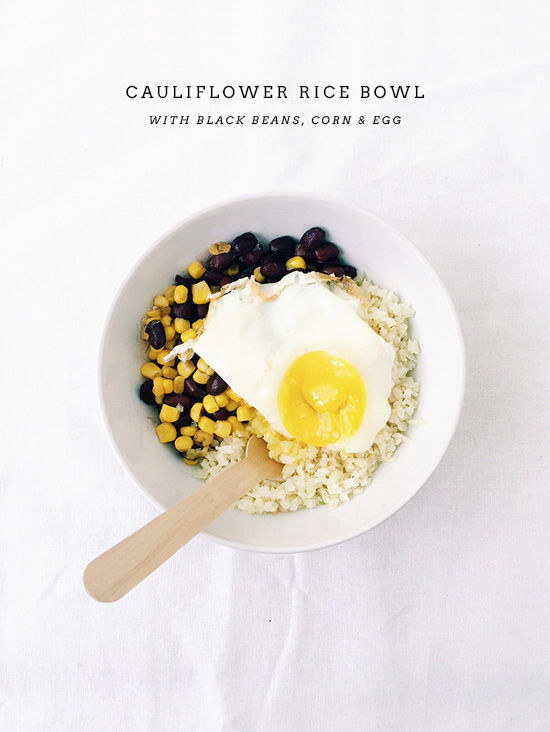 I am definitely going to have to check out the riced cauliflower and make that bowl. LOVE Trader Joe’s. We have a lot of favorites from there, but our newest is the Bolognese Ravioli in the cheese section, topped with their organic marinara and a bit of grated parmesan. The ravioli cooks in just six minutes and is DELICIOUS and the marinara is great – super chunky and flavorful, not your usual jarred pasta sauce. It is definitely going to be in our weekly rotation now. Great post! I am making the curry tonight for my family. I am a terrible cook usually but this seems easy enough! So far so good! Love this post. it’s a sad sad day when I run out of those mini dark chocolate peanut butter cups. We live 1 1/2 hours to the closet Trader Joes so when I go, I go with cooler in the back. I buy cases of their sparkling water. raspberry/lime is one of my favorites. Always on the shopping list is their hummus, chipotle turkey burgers and their sauces. Now I have more things to add to the list. The cauliflower rice sounds incredible!! I’ve made Joanie’s lunch bowl twice now and it’s sooooo good. I loaded it up with veggies. Very easy and delicious. Thanks for the recipe!